Spending on Local Education Declines Across U.S. Spending on local education took a hit during the recent recession, and 2011 was the first year that per student public money spending decreased nationally since the U.S. Census started collecting annual data in 1977 on public education financing. The most recent report shows per pupil expenditures dropping four-tenths of a percentage point between 2010 and 2011. Idaho is near the bottom of the states in per pupil expenditures, ranking 50th in 2011 at $6,824. Utah was last at $6,212. Idaho was more than $3,700 below the national average of $10,560. 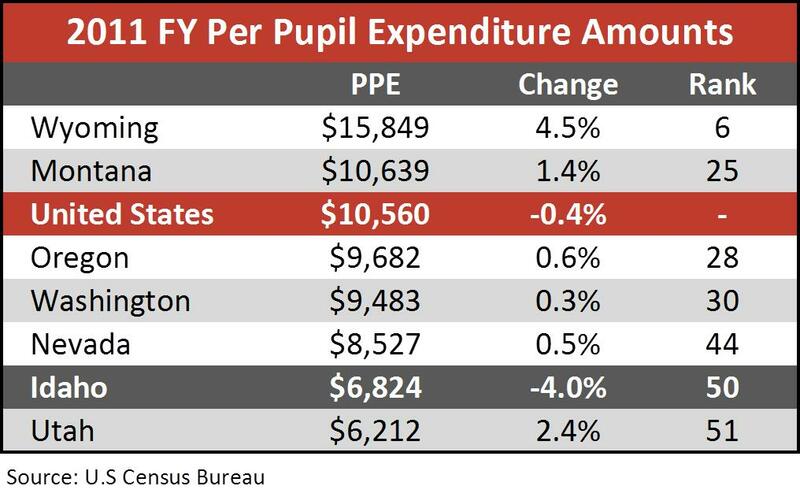 Regionally only two states had per pupil expenditures greater than the national average – Wyoming ranked sixth and Montana ranked 25th. Like the nation, Idaho recorded a decline in per pupil expenditures between 2010 and 2011, but the decrease was 10 times larger than the nation’s at 4 percent. Only three states – New Jersey, Maine and Illinois – had larger one-year declines, ranking from 5 percent to more than 7 percent. Idaho, Maine and Illinois also registered declining student enrollment from 2010 to 2011, and that helped mitigate the declines. Idaho was the only state in the region to register a decline from 2010 to 2011, and Wyoming, Montana and Nevada have avoided any annual declines in per pupil spending since 2006. Oregon, Washington and Utah had declines from 2009 to 2010 with Utah’s the sharpest at 4.6 percent. While Idaho’s overall per pupil expenditure was low, it had the region’s largest proportion of that expenditure dedicated to instruction, just over 56 percent, which was 3 percentage points above the national average. Montana was the only other state in the region with instruction funding higher than the national average at 55 percent of the total. Like most of the other states in the region, Idaho had about 30 percent of its per pupil spending dedicated to support services – administration, maintenance and transportation, and it was the lowest in the region in money earmarked for capital improvements. Idaho’s 4.3 percent in 2011 was less than half the national average. Utah and Wyoming both had more than 14 percent of per pupil spending dedicated to capital improvements. Idaho ranked ahead of Utah in most of the detailed categories of per pupil spending. One notable exception was in general administration, which includes the board of education and superintendent services. Idaho landed in 38th ahead of Nevada, Oregon, Utah and Washington. Regionally, Wyoming topped the list in the three areas – instruction, support services and capital outlays. Nevada was a distant second in most cases, coming in just around the national average. One area where Idaho ranks comparatively better is the ratio of education spending to personal income. The U.S. Census Bureau compared 2010 expenditures to personal income and found Idaho ranked 30th on teacher benefits and general administration and 37th for teacher salaries, below the national average in those and other categories. Funding sources for public education vary among the states. Federal funding levels are similar, but the amounts coming from state and local sources differ. In Idaho, the majority of funds come from the state, primarily from its general tax revenues. Nationally, Idaho ranks fifth behind Vermont, Hawaii, Arkansas and New Mexico in percentage of funds coming from state level sources. All states in the region except Montana have more than the national average of 44 percent provided by state sources. Idaho had the highest ratio of state to local funding support for schools, nearly three times as much state money as local money finances public education. Nationally, state and local sources each provide about 44 percent of total school funding. While Idaho ranks low among the states on many factors in public school financing, it ranks high in graduation rates and test scores. According to the National Center of Education Statistics Common Core Data Sets, Idaho has the third lowest high school dropout rate for 9th-12th-graders at 1.6 percent. Wyoming topped the nation at just over 1 percent. Looking at the average graduation rates for freshmen, Idaho rank 13th, two spots behind Montana with the best ranking in the region. Nevada was at the bottom of both regional lists with the lowest average freshman graduation rate in the country. In terms of 8th grade test scores, Idaho ranked in the top 20 for mathematics, science and reading. Montana recorded the best average test scores for the region in all three categories with Wyoming following in most areas. Nevada was at the bottom of this list as well. This entry was posted in Employment News and tagged education spending, idaho department of labor, idaho economy, youth on July 15, 2013 by Idaho Department of Labor.